Emma Kiley opened Citrine almost a decade ago in West Tisbury. Now located on Main Street in Vineyard Haven, the boutique includes children’s clothing and toys, handmade jewelry, accessories, women’s clothing, and more. The children’s section is full of hand-made toys and clothes of organic cotton, made not-too-far away. “The kid section is so fun, it just makes everybody happy,” Emma says. 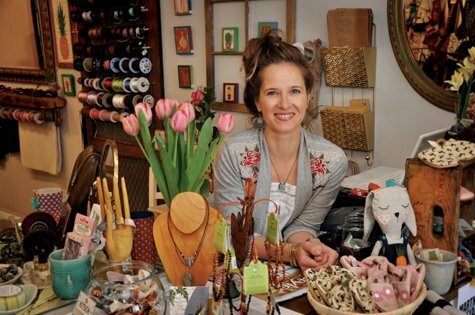 She got her start as a jewelry maker at the Chilmark Flea Market and Artisan Festivals, both she and her store manager, Ali, can create custom pieces for customers right in the store. Although Citrine still sells some imports and manufactured clothing, Emma is focusing more and more on supporting small home businesses focused on quality and individuality. “I love buying local and supporting small,” she says.